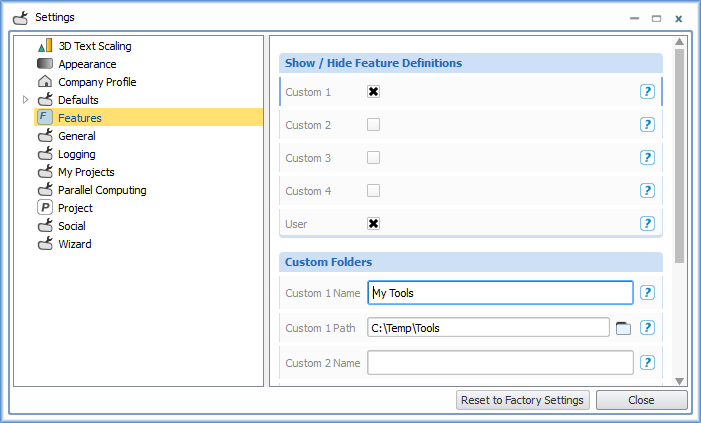 With CAESES® version 4.1.1, we have cleaned up our library of feature definitions that are shipped with the software. These definitions have been in CAESES® for several years now, and many of these definitions needed a complete review. We decided to remove them from the user interface for the time being. New Platform for Feature Definitions: Coming Up! In the meantime, we are working on a new way of offering feature definitions with a better overview and an easy-to-use download and rating system. We keep you posted about the status, there will be a beta version coming up soon! Note that you can additionally load features from various directories by using the custom paths (see menu > file > settings > features). If you set such a custom path, all definitions in a custom directory get displayed in the user interface (menu > features). You can also have your own sub-directory structure in this directory – CAESES® automatically detects it and offers it in the user interface (see step 2, second screenshot) .